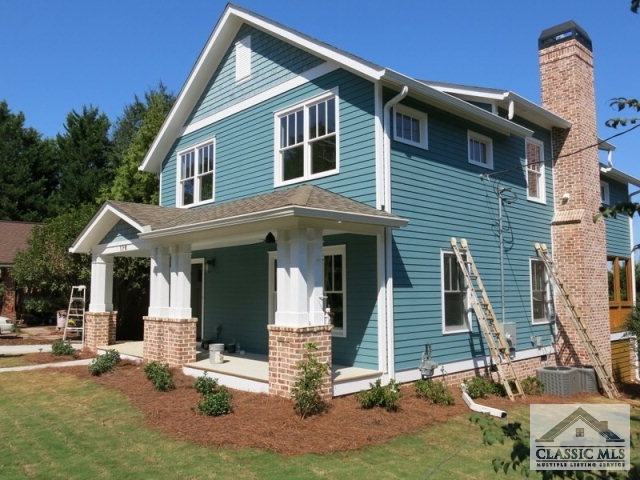 Historic reproduction, 2016 new construction cottage in Historic Boulevard, built by award-winning J W York Homes. Located in one of Athens most desirable In-Town neighborhoods, and on one of loveliest historic streets in Athens, it's centrally located within blocks of a plethora of wonderful destinations: Downtown, highly regarded Chase Street Elementary, restaurants, coffee shops, bakeries, the Arts Warehouse District, independent film and live music venues, Daily Grocery Food Coop, Athens Regional Hospital, multiple college campuses, and is sited next to Boulevard Woods, a neighborhood park.This 2-story, 3/2.5 cottage features multiple porches, an open floor plan, magazine-quality kitchen and stylish baths, large master suite, fireplace with Black Walnut beam mantel, detached 1-car garage, a dedicated office/library/study, and is built to be highly energy efficient and provide low maintenance, comfortable living. A wonderful addition to the community/neighborhood, this property offers the best of the Athens in-town living experience! 124 Boulevard, Athens GA 30601 is a Home, with 3 bedrooms which is recently sold, it has 2,448 sqft, 0.0 - 0.25 sized lot, and Detached parking. A comparable Home, has 2 bedrooms and 1 baths, it was built in and is located at 153 New Ave Athens GA 30601 and for sale by its owner at $ 310,000. This home is located in the city of Athens , in zip code 30601, this Clarke County Home, it is in the Boulevard Subdivision, and Boulevard are nearby neighborhoods.